Passed and Completed completion triggers are enabled by default on GrassBlade LRS. However, make sure its enabled, and that your WordPress URL is configured correctly. If it doesn't work, try using the WordPress URL as Trigger URL. One or the other may or may not work depending on theme and plugins you are using on the site. If you are using a plugin that restricts the entire website including ajax url without login, Triggers may not work. Make sure you include http:// or https:// in the url. If you want LearnDash course status to show "In Progress", as soon as a user starts a content under that course. You can add an additional trigger for "attempted" verb. You might need to use "launched" or "initialized" verb if that is what your content is sending instead of "attempted" verb. Please note that the Trigger URL, for this is different from completion Trigger urls. Go to xAPI Content section in your WordPress. Add or Edit the content you want to enable completion tracking for. Tick the checkbox that says, "Enable Completion Tracking"
Add your content to LearnDash lesson, topic, or quiz using the meta box on the right top of the edit page. If you want the quiz scores to be passed back to LearnDash reports, or if you want to award certificates based on Tin Can quiz scores, you would need to make sure that the Tin Can content is added on a LearnDash Quiz. I'm using LearnDash to organize e-learning courses in my WordPress site. I have quite a lot H5P content in my LD courses and I'd like to track user completion of such content with GrassBlade LRS. Could you explain how to do it? As replied to you on your support ticket. 2. 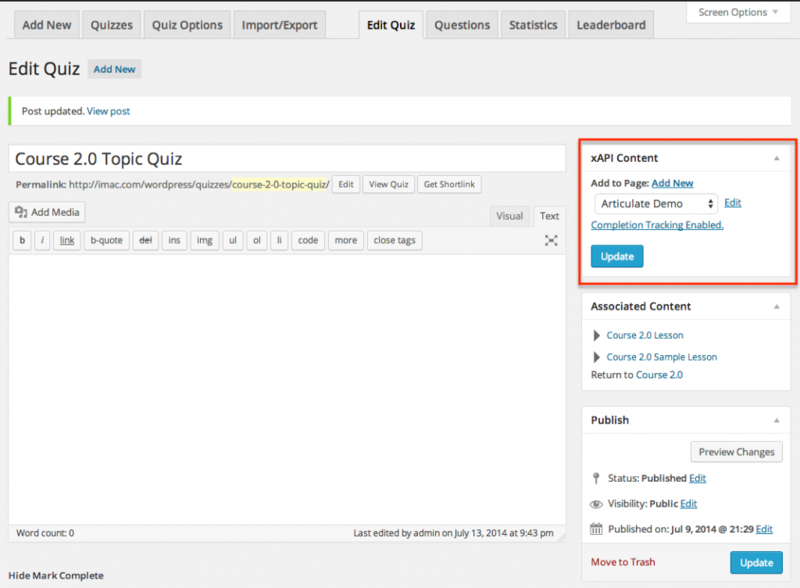 Create an xAPI Content page and select the H5P content you have created from H5P tab. 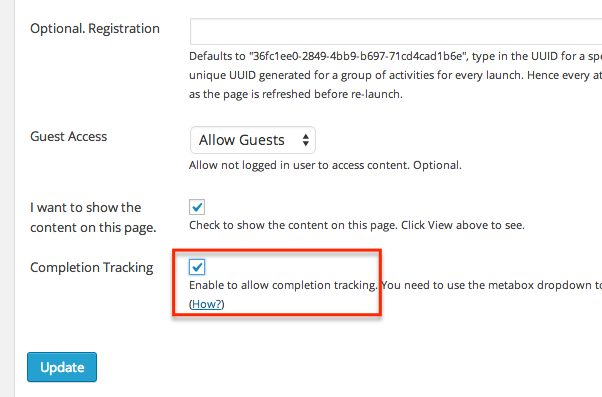 Enable Completion Tracking if you want the users not to be able to progress without actual completion of this content. 3. Create or go to the LearnDash lesson or topic. Select the xAPI Content from the dropdown metabox from top right.